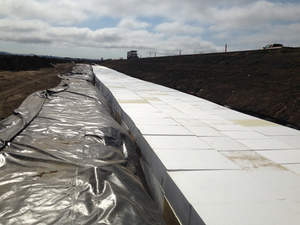 DENVER, CO--(Marketwired - Apr 14, 2015) - The use of ACH Foam Technologies' EPS Geofoam rescues an area in San Pablo Bay where construction has been underway to restore the wetlands at Cullinan Ranch. Ducks Unlimited and the U.S. Fish and Wildlife (FWS) are working together to restore over 1,500 acres of tidal wetlands in the San Pablo Bay National Wildlife Refuge. The site had been diked off from the tides for over 100 years and was farmed primarily for oat/hay production. Before the tidal waters could be reintroduced, a three mile stretch of levees along Highway 37 needed to be protected from erosion. In order to mimic natural transitional zones from wetlands to uplands, the FWS wanted to grade flat slopes from the highway embankment into the new wetlands. But due to the soft soils in the area, known locally as "Bay mud", CalTrans, the state highway department, was concerned that any additional weight placed on the embankment could cause long term settlement of the roadway. In order to keep the natural transitional slope design, Ducks Unlimited proposed using Geofoam which is approximately 1% of the weight of traditional soil fill and still has the structural load bearing capacities to withstand weight of up to 18.6 psi at 1% deformation. "Geofoam was not only the quickest solution for this project but the cost was on par with other options as well" said Russ Lowgren, an engineer with Ducks Unlimited on the project. "We had never used Geofoam before, so there was a learning curve, but overall, the project went smoothly," said Scott Ghilotti of Maggiora & Ghilotti, Inc., the contractor for the project. For more information visit ACH Foam Technologies or phone 800.525.8697.